The Republic of Tunisia makes an interesting case study in the context of higher education development in the MENA region. This is in view of its strong tradition and culture of promoting education, and the accolade it receives for possessing among the most developed higher education systems in the region, despite its comparatively less affluent economic condition. 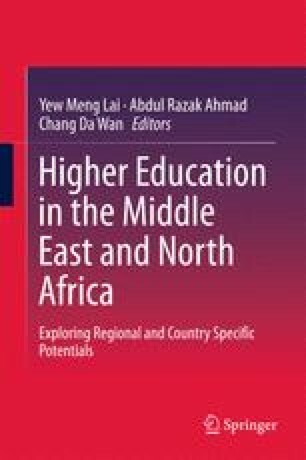 This chapter examines the development of the national higher education agenda of Tunisia, in terms of the provision of international students, research, and training collaboration, as well as network expansion. It explores the challenges and prospects offered from the politico-security, economic, social, legal, and educational perspectives as a means to develop important insights that could assist in the making of strategic recommendations for would-be higher education providers and their higher education institutes, in the quest to extend their outreach to this post-conflict state in the MENA region. Brtisich Council. (2014). Mapping UK-Tunisia higher education cooperation: Challenges and opportunities. Retrieved from http://www.britishcouncil.tn/sites/default/files/mapping_uk-tunisia_higher_education_cooperation_final_versiondocx.pdf. Business Monitor International. (2013, April). Risk summary—Tunisia—April 2013. BMI Research, Africa Monitor, North Africa. Retrieved from http://www.africamonitor-newsletter.com/risk-summary-tunisia-apr-2013. Cafiero, G. (2012, September 26). Saudi Arabia and Qatar: Duelling monarchies. Foreign Policy in Focus. Retrieved July 28, 2013, from http://fpif.org/saudi_arabia_and_qatar_dueling_monarchies/. Central Intelligence Agency. (2012). The world factbook 2012. Retrieved October 12, 2013, from https://www.cia.gov/library/publications/the-world-factbook/index.html. Central Intelligence Agency. (2015). The world factbook 2013. Retrieved September 3, 2014, from https://www.cia.gov/library/publications/the-world-factbook/geos/ts.html. Clark, N. (2006, April 1). Education in the Maghreb: Tunisia. World Education News & Reviews, 19(2). Retrieved from http://wenr.wes.org/2006/04/wenr-apr-2006-education-in-tunisia/. European Commission (2013, May 14). Increased education opportunities between Tunisia and EU. European Commission: Press Release. Retrieved January 16, 2016 from file:///C:/Users/User/Downloads/IP-13-421_EN.pdf. Gall, C. (2014, February 7). Despite signs of progress, security issues rise in Tunisia. The New York Times. Retrieved from http://www.nytimes.com/2014/02/08/world/africa/despite-signs-of-progress-security-issues-rise-in-tunisia.html?_r=0. Haroon. M. (2014, January 30). Want to defeat al-Qaeda? Start with Tunisia. Al Arabiya News. Retrieved from http://english.alarabiya.net/en/views/news/world/2014/01/30/Want-to-defeat-al-Qaeda-Start-with-Tunisia.html. Human Rights Watch (2015, June 2). Tunisia: Law falls short on judicial independence: Increase autonomy of judges’ oversight body. Retrieved from https://www.hrw.org/news/2015/06/02/tunisia-lawfalls-short-judicial-independence. International Monetary Fund. (2014, February 12). Tunisia: First and second reviews under the stand-by arrangement, request for waivers of applicability and non-obervance of performance criteria (Country Report No.14/50). Retrieved from https://www.imf.org/external/pubs/cat/longres.aspx?sk=41331.0. Ministry of Higher Education and Scientific Research, Tunisia, and Federal Ministry of Education and Research, Germany. (2015). Joint Announcement between the German Federal Ministry of Education and Research (BMBF) and the Tunisian Ministry for Higher Education and Scientific Research (MESRS), July 2015. Retrieved January 16, 2016 from file:///C:/Users/User/Downloads/TUNGER-2015_call-text.pdf. Nashashibi, S. (2013, December 30). For Arabs, a bad 2013 leaves little hope for 2014. Al Arabiya News. Retrieved from http://english.alarabiya.net/en/views/news/middle-east/2013/12/30/For-Arabs-a-bad-2013-leaves-little-hope-for-2014.html. Romdhani, O. (2014a, January 5) Unending self-immolations in Maghreb. Al Arabiya News. Retrieved from http://english.alarabiya.net/en/views/news/africa/2014/01/05/Unending-self-immolations-in-the-Maghreb.html. Romdhani, O. (2014b, January 28). Tunisia seeks new beginning through constitution. Al Arabiya News. Retrieved from https://english.alarabiya.net/en/views/news/middle-east/2014/01/28/Tunisian-Constitution-Seeking-a-new-departure.html. Sawahel, W. (2014, April 11). New Tunisia-US higher education initiatives announced. University World News, Issue No. 0315. Retrieved January 16, 2016 from http://www.universityworldnews.com/article.php?story=20140410132816242. Sawahel, W. (2015, June 19). Tunisia: New 10-year higher education and research reform plan. University World News, Issue No. 0372. Retrieved January 16, 2016 from http://www.universityworldnews.com/article.php?story=20150619113344278. Today’s Zaman. (2013, October 13). Turkey ready to work with any democratically elected government in Tunisia. Retrieved from http://www.todayszaman.com/diplomacy_turkey-ready-to-work-with-any-democratically-elected-government-in-tunisia_328826.html. UPI. (2013, March 18). Tunisian cab drivers go on strike. Retrieved from http://www.upi.com/Business_News/2013/03/18/Tunisian-cab-drivers-go-on-strike/87781363621056/. World Bank. (2012). World development indicators. Retrieved November 8, 2012, from http://data.worldbank.org/data-catalog/world-development-indicators. World Bank. (2015). World development indicators: Data: Tunisia. Retrieved February 13, 2015, from http://databank.worldbank.org/data//reports.aspx?source=2&country=TUN&series=&period.